Mr Yadav also released a list of presidents of party units in states at a press briefing. Members of an ad hoc committee for Bihar were also announced, which will be headed by former minister Ramai Ram. 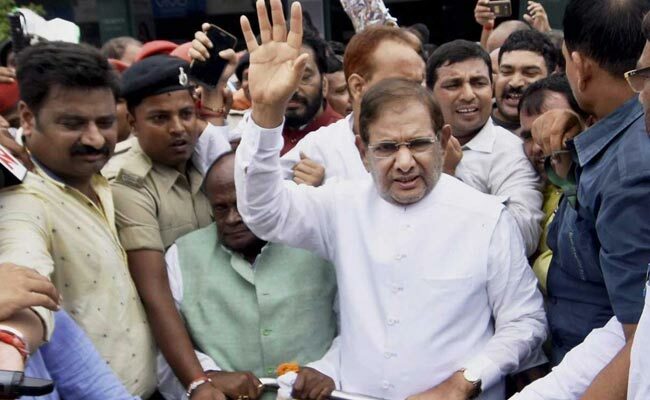 New Delhi: The Sharad Yadav faction of the Janata Dal (United) Party today announced election to party posts on March 11 and released a list of interim office-bearers, including Chhotu Bhai Vasava as working president and Ali Anwar as one of the vice-presidents. Mr Yadav had earlier approached the Election Commission staking claim over the JD(U)'s election symbol. He said today at the press conference that the group had produced 429 affidavits in support of its claim. Bihar Chief Minister Nitish Kumar-led JD(U) has also submitted affidavits of its MPs and MLAs in support of Kumar's leadership. This faction has maintained that an overwhelming number of its party leaders are with Nitish Kumar and only a handful of them support Mr Yadav. They have also approached Rajya Sabha Chairman M Venkaiah Naidu and filed a plea seeking disqualification of its rebel MPs - Mr Sharad Yadav and Mr Ali Anwar. In response to a question about a notice from the Rajya Sabha asking the two MPs to appear before the chairman, Mr Yadav told reporters that his "lawyers were examining the matter". Mr Yadav has come out against Mr Kumar tying up with the BJP and joining NDA. He has joined hands with the Congress and opposition parties. On the controversy over the Election Commission allegedly delaying announcement of schedule for Gujarat elections, Mr Yadav told reporters that the body must maintain the role of an "honest referee". "The decision not to announce elections to Gujarat and Himachal Pradesh simultaneously was not correct...This has happened for the first time. I want to say to those who are in EC that their predecessors were fair and unbiased despite different kinds of pressures and worked like honest referees," Mr Yadav said. He also hit out at the government for not fulfilling its promises on employment generation, farmers' welfare and instead creating controversies around the Taj Mahal. "They have forgotten their promises and are talking about mandir (temple) and masjid (mosque)," Mr Yadav said, in an apparent reference to alleged communal polarisation.